I recently revived my subscription to Gamefly (no, this isn’t sponsored) because I don’t have enough going on in my life outside of law school and these MMOs that I am allegedly playing. Essentially I wanted a cheap way to play some games that I have had my eye on but never really wanted to buy or more specifically put a down payment on at Gamestop and return within the seven day return period because the policy is great and no matter how annoyed the employees get there’s nothing they can do to turn me down. Is this justification for me writing off my Gamefly subscription as a business expense? If only I knew a lawyer. The first game I’m going to talk about is one that is near and dear to my heart. I bought Luigi’s Mansion back on the Gamecube when it originally came out and I have to say the game creeped me out as a tween. It made me ask a lot of questions, like how in this timeline apparently Bowser is legitimately dead. The Mario series has always tiptoed around the idea of death, it’s a kid’s game after all, and Bowser has been “killed” and reanimated by Koopa and other figures numerous times through the series. Porting Luigi’s Mansion to the 3DS instead of the Switch makes sense in a twisted sort of way. Way back before consoles could do much online, Nintendo had the plans to make the Gamecube a 3D capable system, they even went as far as creating a couple of prototype games that could take advantage of this technology including none other than Luigi’s Mansion. The technology for a 3D overlay on televisions was ultimately too expensive, but Nintendo basically had everything ready to go. They just needed seventeen years and a new system to accomplish it. I like to think that the folks at Nintendo had a serious discussion about whether to port this to the aging 3DS or the exploding Switch, and some guy who was on the original team threw a fit about not wanting his work to completely go to waste. Luigi’s Mansion also happens to be one of those titles that kids like me would make fun of other gamers for spending their meager allowance on. I love Luigi’s Mansion, but I refuse to pay full price for it at the age of thirty as much as I did at the age of twelve. The full game, assuming you’re stopping to take in the sights, can be beaten in less than seven hours. In my days we called that a half-Blockbuster. You rent it on Friday/Saturday and you’ve done everything by Sunday afternoon with enough time left to still neglect your homework due Monday. It’s a great game, no doubt, but something that short needs to have some level of replayability otherwise why keep it in your collection? This marriage of gameplay and technology doesn’t show up empty handed, and Luigi’s Mansion offers something old, something new, something borrowed, and something Boo. We have our basic story; Luigi wins a scary mansion in a contest and he heads over to meet up with Mario to give it a once-over before he presumably torches the place for the insurance money. Mario enters the mansion before Luigi gets there and goes missing. 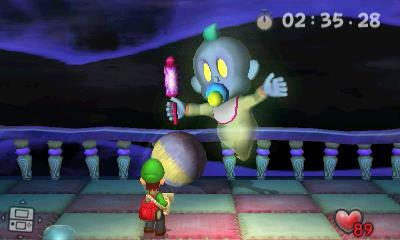 Luigi follows and gets attacked by ghosts, only to be saved by Professor E. Gadd, who looks like an infant and equips Luigi with a powerful vacuum capable of sucking up ghosts. 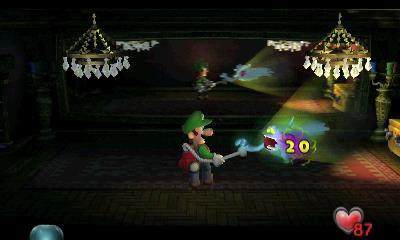 In a sense, Luigi’s Mansion is an early game in the Boss Rush genre with some Metroidvania thrown in for good measure. You control Luigi in what is a mostly linear path throughout the mansion, unlocking doors, clearing rooms of various ghosts, and finding keys and gems and completing puzzles. What difficulty there is comes from the “portrait ghosts,” the unique looking ghosts that Luigi eventually turns into fancy portraits. These bosses generally have their own mechanics on how they fight, how to expose their hearts and vacuum them up, and how to even activate them to begin with. Again, I use the term “difficulty” with some leeway. Luigi’s Mansion isn’t exactly difficult, certainly not Nintendo difficult. But Luigi’s Mansion has a metric ton of charm to it, like how Luigi will start humming in sync with various parts of the game’s soundtrack and if you are in a room that hasn’t been cleared of its ghosts or Boo, you’ll hear them mockingly singing right along. Replacing Luigi’s Game Boy Horror from the original game is the…Game Boy Horror in this game. It’s a spruced up version that is constantly on display on the bottom screen with a minimap letting you know where you can go and what your progress is at any given time. 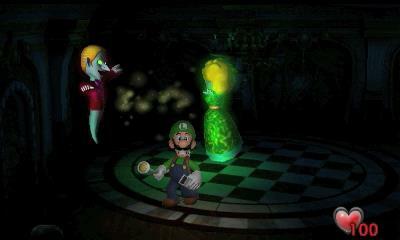 Luigi’s Mansion features a new co-op mode where a second person can take on the role of Luigi’s gooey clone Gooigi and you can tackle the mansion together. I don’t have any friends, so I did not test out this feature. One thing completionists will like is that the game now allows you to re-fight bosses in order to get a better rank (sucking them with less falls) without playing through the whole game over again or save scumming. If you want the best portraits, it’s a lot easier than the last time around. 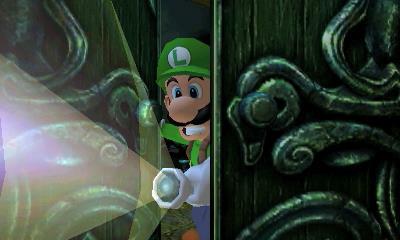 Luigi’s Mansion is a wonderfully charming game. If you played the Gamecube version and want to revisit it on a modern console, go right ahead. If you didn’t play the game the first time around, I wholly recommend at least renting it.